Ah, this week has been an intense one with lots of back to back photo shoots at work and some late night prep sessions. All the more reason to pack up my bags (again) for a quick little getaway to LA this weekend. Surprisingly, for how close LA really is to SF, I don't make it down quite as often as I'd like. I'm looking forward to some quality beach time with friends, my first ever surf lesson (wish me luck!) and a fun little project that's in the works -- more on that soon! Beach reading material: I limit myself to two magazines for quick trips like this. One that's more dense in content (like Monocle, which I love) and one more fashion related for easy beach flipping. COVERGIRL Clump Crusher Mascara: For weekends that I just really want to getaway and unwind, I don't like to bog myself down with an excessive makeup routine (plus, it's great for your skin to just take a break every once in a while). Mascara always makes the cut though. If I go light on everything else, I love playing up my eyes and this one by COVERGIRL is quickly becoming an MVP in the rotation. The curved brush has very precise bristles that lets you load up on volume, minus the whole clump part. La Roche Posay Moisturizer + SPF: I was recently introduced to La Roche Possay and am hooked on their entire skin care line. This moisturizer + SPF is a daily go-to, especially for my beach time ahead. It's light and non-greasy, which is perfect for me since my skin is oil-prone. Diptyque "Vetyverio": Most days, I like to rotate through several different scents, depending on my mood and the day's activities. For a beach getaway like this, "Vetyverio" fits the bill -- it's light, airy and slightly woody, which seems quite apropos for sunny, surf-filled days. Dermalogica face mask: After spending a lot of time in the sun lately, I've been making more of a point to set aside dedicated facial mask time. Aesop hand + body balm: Well, I never really leave the house without these. Plus, I love how they smell combined with my Diptyque scent. Crest 3D Whitening Strips: Throwing a few of these in my beach bag so I can throw them on while I work on my tan. Multi-tasker over here! Cuyana travel cases: My friend Heather recently picked up some Cuyana travel cases for our trip to Turkey and I have to admit, I was so envious of her set the entire time that the minute we touched back down in SF, I promptly picked up a set of my own. Third Love separates: While most of my bag is pretty laid back (read: lots of bathing suits and cover ups), I love bringing along little luxuries like this lacy number from Third Love. It just elevates casual separates, especially a slouchy tank. Love seeing what's in your bag! I was just introduced to Third Love and I'm a HUGE fan myself! Thanks for introducing me to ThirdLove! I don't just want but NEED those makeup cases! 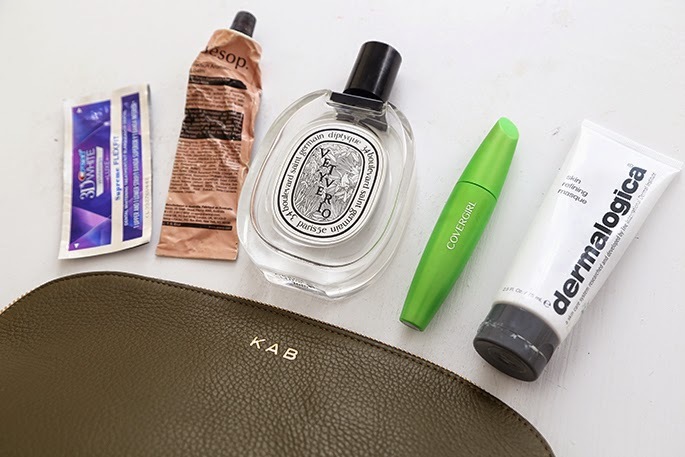 love these what's in my bag posts!